Molds are commonly found in homes and commercial buildings, and if left untreated can cause health problems to those that are exposed to them. Molds need moisture to grow, and consequently, thrive in damp conditions or in buildings/rooms that have a high humidity and poor air circulation, such as bathrooms and showers. Molds reproduce by spores, which they release into the surrounding air. It is these airborne spores that can irritate the nose, eyes and throat, and cause respiratory conditions – including asthma – in sensitive individuals. Long-term exposure to toxic molds – molds that produce mycotoxins – can severely compromise human health, causing neurological disorders and even death. If you or members of your family are suffering from any of these symptoms, it may be a good idea to examine your home for the presence of mold. Mold growth may be very obvious, but it can also go undetected in air-conditioning ducts, ceilings, or other obtuse places that are prone to leaks or dampness. If you detect mold growing on walls, ceilings, carpets or other surfaces of your home, there are a number of methods you can use to eradicate it. However, some of the more common methods used to remove mold contain fungicides and toxic chemicals, such as bleach or chlorine, that are not very environmentally friendly. Chlorine readily dissolves in water where it combines with other chemicals to form toxic compounds that are not only toxic to aquatic organisms and soil microorganisms, but also hazardous to human health. Chlorine can also vaporize into air, where it combines with other chemicals, transforming into toxic carcinogenic vapors. What's more, because chlorine is just as much of a respiratory irritant as mold, these chemicals can be equally- if not more hazardous to a person's health than the mold itself. The good news is that there are environmentally friendly methods of mold remediation available. 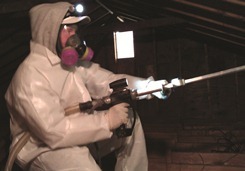 These range from simple DIY home solutions to more complex methods used by specialist mold remediation companies. Eco-friendly Dishwashing Liquid and Borax Solution – add a squirt of eco-friendly dishwashing detergent and a teaspoon of borax to one quart of water. Sponge the solution onto moldy surfaces, then rinse off and leave to air dry. Hydrogen Peroxide Solution – dilute ½ part hydrogen peroxide to 1 part water and wash over moldy surface. Baking Soda and Vinegar – these natural cleaning products can be used for a number of areas around the house, but for getting rid of mold, first dilute 1 part vinegar with 1 part water, then mix in 2 parts baking soda to 1 part vinegar solution to form a thick paste. Spread this over the mold and leave to dry, then scrub it off. If the mold is particularly stubborn, you may need to repeat the process. Essential oils that can be used effectively to remove mold include tea tree oil and grapefruit seed extract. Grapefruit Seed Extract – add 20 drops grapefruit seed extract to 2 cups water, then spray onto moldy area and leave to dry. Tea Tree Oil – tea tree oil has natural anti-microbial properties, which makes it effective at combatting mold. Add 1 teaspoon of tea tree oil to 2 cups water, then spray onto moldy area and leave to dry. Disadvantages: some essential oils (such as tea tree oil) have a strong pungent fragrance, which may linger for a couple of days. If your mold problem is more severe, you may need to consider purchasing a commercial mold cleaning solvent to tackle the job. The good news is that there are environmentally friendly commercial mold cleaning agents available. These products are typically biodegradable, pH neutral, contain no harsh chemicals, and no toxic pesticides that can be harmful to humans and animals. Examples include: Naturally Clean Mold & Mildew Remover by ChemFree Solution, and MoldOff. Disadvantages: Could be costly for large areas. Dry ice blasting to is a relatively new technology that is fast becoming the method of choice to remove mold by environmentally concerned mold remediation specialists. Dry ice blasting effectively removes mold by blasting it with particles of dry ice fired under high pressure, in much the same way as a jet of water is shot from a pressure washer. The low temperature and high impact of the dry ice kills and removes mold without the need for scrubbing and sanding contaminated surfaces. Yet his method is 100% environmentally safe as it contains no chemicals or toxins, and emits no hazardous dust in the mold removal process. Advantages: extremely effective, fast, non-toxic, no hazardous dust emissions, environmentally friendly, no scrubbing required, special nozzles allow access to hard to reach nooks and crannies. While the above eco-friendly mold remediation techniques can get rid of mold, if the environmental conditions that encouraged its growth in the first place persist, the mold will likely return. Mold remediation should therefore also address issues such as damp areas, leaks, humidity, and air circulation, taking corrective action to reduce excessive moisture build-up where necessary. The following article is written by Carl Bennett who has 25 years of hands-on experience dealing with mold problems. He is a president of Above & Beyond Unlimited Cleaning – a certified New Jersey based mold remediation company specializing in providing mold removal services.